Contact Us - National Agrochemical Distributors Ltd. If you have any specific queries about NAD or its products, you can request more information by using the form below. 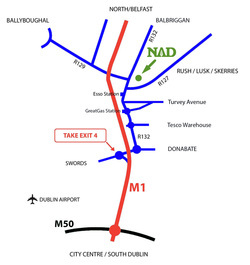 NAD IS LOCATED AT BLAKES CROSS, LUSK, CO. DUBLIN, CLOSE TO EXIT 4 OFF THE m1 - 10 minutes north of dublin airport. Follow M50 - M1 take Exit 4. At roundabout take the 1st exit onto the R132 (signposted for Skerries). Drive 2 kms while passing two small roundabouts to see an ‘Esso’ Service Station on the left hand side. After ‘Esso’ turn right immediately (signposted for R127 - Skerries, Lusk, and Rush). Turn left into ‘Ace Express’, we are located directly behind them. From M1 take Exit 5. At roundabout take the 1st exit onto the R132 (signposted for Balbriggan, Rush and Lusk). Drive 200 metres to the next roundabout, at ‘Applegreen’ Service Station on the left hand side. 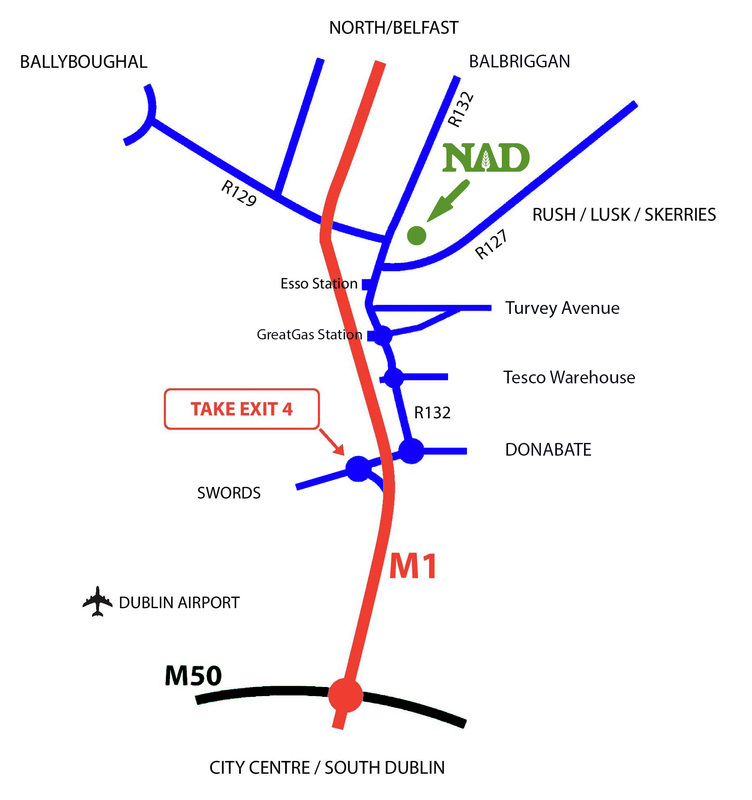 Take the 3rd exit onto the R132 (signposted for Swords, Rush and Lusk). Drive 7 kms, you will pass a small ‘Applegreen’ Service Station on the left hand side and drive through Corduff Village. Keep driving until you reach Blakes Cross and turn left (signposted for R127 - Skerries, Lusk, and Rush) before reaching ‘Esso’ on the right. Turn left into Ace Express, we are located directly behind them.